vi, 69 leaves. : illus. ; 28 cm. criticism and procedural mechanics from Mr.
II. IM ETHOD . .
V. S UMMAR0Y ... lV.. ... ... ... .
Alley with Shift to Small Incentive . Alley with Shift to Large Incentive. Alley with Shift to Large Incentive . quantity of food consumed over two consecutive days. started it is difficult to stop"
his parents after the operations. does not seem to be entirely predictable. as electrical stimulation of this area can give rise to seizure discharges. such expression than is the older corticomedial portion. of response to changes in magnitude of food reward. Schwartzbaum appears to prefer the former alternative. cific dampening of emotional responsiveness. ipatory goal response tends to be elicited in the presence of these cues. prior to the goal response. reasonable test of any motivational changes produced by brain lesions. distinctive and readily discriminable from the non-positive one. way with two different magnitudes of reward. the groups will not differ in terms of acquisition. were maintained on a 12 hr. throughout the course of the experiments. 10th post-operative day at which time he died. on a dosage of 60 mg.
were removed with a trephine. bar was placed 5 mm. a Grass R/F lesion maker. unit intramuscular injection of procaine penicillin. boxes were covered with a 1/4 in. or reactivity of the animals. 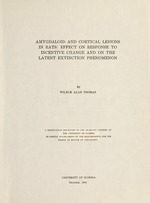 of the experiment on latent extinction. pre-operative and two post-operative measures. laboratory chow and water weighing approximately 200 gm. food reward of 45 mg.
From 24 to 48 hr. T maze with a 180 mg.
groups to a latent extinction condition. were run with a 10 min. in any block of four trials. by a 10 per cent formalin solution. and sectioned at 20 micra. placed on a slide and stained with cresyl violet. then photographed '(see Appendix B). cant group or interaction effect. action for running speed (Table 6). es but does not attain statistical significance. Since the data on running speed with a 90 mg.
T maze and latent extinction. shows no significant group differences. an F test indicates no significant main effects or interaction. sumed over the two-day period. reward and for running speed with a shift from large to small reward. groups interaction for running speed. as compared to the control groups. than the maintenance of behavior. goal box were painted black. marily of a motivational nature. tion of complexity or difficulty of the task. motivational factor such as incentive-motivation. would seem to be explicable only by reference to a motivational construct. a time course change following these lesions. fiable neurological differentiation for this effect. in amount of food consumed. flect something other than enhanced motivational level. ing to classes of stimuli other than food. day at which time the initial food consumption measures were taken. post-operative weight gain of 8. 9 gm. nificant attenuation effect of both amygdaloid and cortical lesions. scale and an increase in sustained motivational level. tional interpretation of amygdaloid function. tionality changes and amount of food consumed. inability to interrelate different reinforcing events. ly represented a non-localized brain damage effect. motivation or an association effect of the lesion. would seem to be most compatible with a motivational interpretation. of amygdaloid lesions on food intake. --Leaps in air and runs about in fright. and rat is grasped firmly but not roughly. K., and Brobeck, J. R.
ty of rats with lesions in the amygdaloid nuclei. , and de Groot, J.
sions and behavior in cats. and its efferent pathway to the brain stem. reduction of secondary reward value. A review of theory in physiological psychol. and somesthetic learning and perceptual capacity. on transposition along a brightness continuum.